Belvedere Seniors Living considers employees as its most important resource. The owner and leadership team recognize that to ensure provision of quality care and support to residents, the best approach is to invest in a qualified and committed staff who are as passionate about their jobs as they are about serving residents. Staff consider their work as not just a job, but a well-regarded vocation and one which is valued by the employer. Staff at all levels are committed to contributing their skills and abilities to ensure each resident is able to achieve the highest level of well-being and independence possible, consistent with their particular health circumstances. Each person is oriented and trained on the equipment they will use in the course of their duties. Annual reviews and updates on such equipment are provided. When new equipment is purchased, staff members who use such equipment are required to participate in training sessions on the appropriate and safe operation prior to it being put into operation. These training sessions are arranged in conjunction with the suppliers. Emergency Preparedness including Fire Training and Drills, Evacuation Procedures, Areas of Refuge, Earthquake, Bomb Threat, Intruder Alert, Hazardous/Toxic Disaster, and the role the facility will play in a major disaster (as part of an overall plan for the community). First Aid protocols and procedures: first responders, first aid attendants, first aid stations. The best way to contact us about Career Opportunities is to email belvedere_hr@telus.net. Please do not call directly as you will be asked to email instead. In your email please clearly state the area of employment you are interested in; full time or part time work, provide adequate contact information and attach your resume. Acceptance of a resume will not guarantee an interview and/or employment. 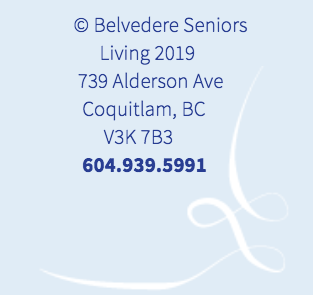 Belvedere Seniors Living reserves the right to select the applicants it chooses to interview for positions, and/or employ.